The vaporizer ZIG ZAG INSETTIVIA TROPICAL LOTION NO GAS GERANIO AND CITRONELLA GIAVA is a repellent insect that defends you from the Common Mosquitoes (Culex Pipiens) and Tigre (Aedes Albopictus) for 7-8 hours and from the Ticks (Ixodes Ricinus) for over 5 hours. Provides optimal long-lasting protection even in critical conditions, such as wetland marsh areas, during hunting, fishing, camping etc. 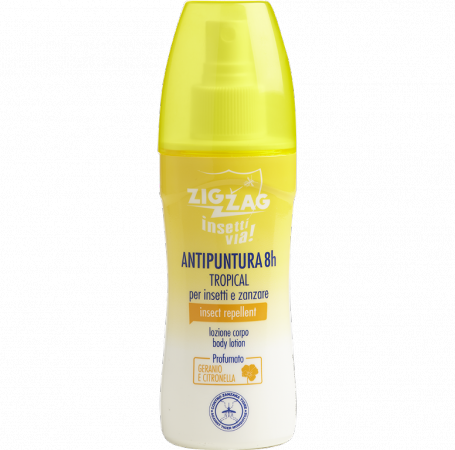 Notes: Zig Zag Insettivia Tropical Lotion No Gas is an anti-body lotion, long lasting and effective, ideal to keep away the most aggressive insects such as tropical mosquitoes. This product is also available in "talco di Marsiglia", "bitter lime" and odourless. To defend against Common Mosquitoes, Tigers Mosquitoes, Ticks and other particularly annoying insects, vaporize two, three times insettivia! on the hands or at a distance of 10 cm directly on the uncovered parts of the body. Do not dispense directly on the face, but spray a little product on the hands and apply it taking care to exclude eyes and mouth. Avoid contact with plastic materials and lacquered surfaces. On the parts of the body. On non-delicate fabrics (thick canvas, cotton, blue jeans,internal drive, etc.). Food and food containers. Of flame or any incandescent material. Plastics and lacquered surfaces (eg. Watch dials). They act by inhibiting the nervous system and of the attivitainsect, annoying and keeping it that far.